Now upgrade your broadband to V-fiber and enjoy the superfast speed. Extra charges are not applied to this upgrade. Also, select the best plans that will suit you with extra benefits. Free Router will be awarded for the plan you select. Verified on 23 Apr 2019. Airtel Money is Offering Rs 50 cashback on Electricity bill payments using the Airtel Payments Bank.This is is applicable only when the transaction is done through Airtel Payments Bank (wallet or savings account) on Myairtel app, Airtel Money app, biller website or USSD. This is applicable only to users who have not done electicity bill payments using Airtel Payments Bank. Get Maximum Cashback of Rs 50 by Using the above airtel money coupon code.This Airtel code can be availed only once per user.Cashback will be credited to Airtel Payments Bank wallet or savings account within 3 working days of the transaction. Airtel Payments Bank also reserves the right to discontinue this offer without assigning any reasons or without any prior intimation whatsoever. This is not applicable on funds transfer between two persons or between person and bank. Do Airtel Recharge now. 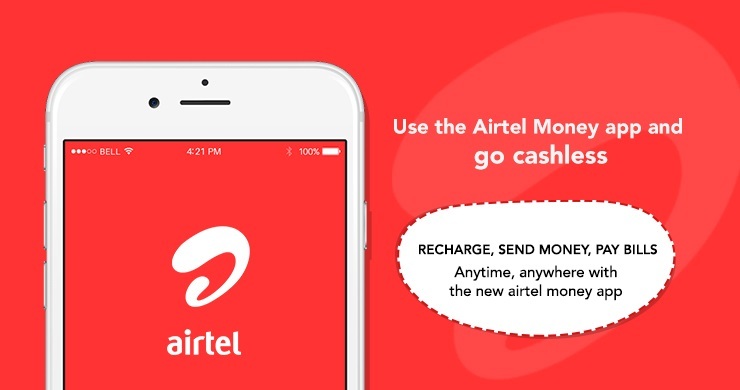 Coupon/Offer Details: Grab flat Rs 100 cashback upon registering to Airtel Money. Grab this hot deal here and now. Just register to Airtel Money and get Flat Rs 100 cashback on the first transaction. Also, avail other offers like flat Rs 50 cashback on the first prepaid offer. The minimum amount of transaction required to get the cashback is Rs 200. Hurry!! How to get 100% Cashback on Airtel Recharge and Bill Payments? 1) User needs to use Airtel Recharge Offer Code in every transaction in paytm that is to be considered for Lucky Draw. Avail flat Rs 50 cash back on transferring money using Airtel Payment bank. Using BHIM mode of transfer is mandatory for achieving cash back offer. Verified on 23 Apr 2019. Airtel Recharge is Offering 5% cashback on Airtel Prepaid Recharge and Bill Payments using Airtel Payments Bank wallet. This is applicable only when the transaction is done through Airtel Payments Bank (wallet or savings account) on Myairtel app, Airtel website or USSD. This is applicable for Airtel Prepaid Recharge and Bill Payments only. Maximum cashback applicable per transaction is Rs 25. This Cashback will be credited to Airtel Payments Bank wallet within 3 working days of the transaction. This can be availed on first two cashback eligible transactions (cumulatively across Myairtel app, Airtel Money app, Airtel website or USSD) by a user. Pay Now. Cashback will be credited only on bookings through Airtel APP. Now install my Airtel app and avail 3 months Netflix subscription for Free. Limited period offer and valid for all users. Now book at PVR cinemas and avail flat 15% cash back on movie tickets. The minimum booking value is Rs 600 and the cash back amount is up to Rs 150. Coupon/Offer Details: Verified 10 Minutes Ago. Paytm Recharge is Offering Up to Rs 30 Cashback On Airtel Mobile Recharges and Airtel Bill Payments by Using the Code. Get Maximum Cashback Of Rs 30. This code can be used 2 times per user/number. This code is valid on Airtel Recharge & Airtel bill payments. Cash back will be credited within 24 hours of the transaction into the user's Paytm Account. Here You can opt for any payment method of your choice i.e. Debit/Credit Card, Net banking or Paytm Wallet. You can recharge and make your bill payment anywhere & anytime with their online service in few easy steps. Apply this code to get this cashback on your online recharges. Recharge Now. Airtel pre-paid plans are much simpler and easier to use. Now you can updrade your internet speed through Airtel money app. Upgrade to superfast speed with V-Fiber with Airtel plans which are at affordable prices. These unlimited Internet plans are available to every users in the country.Select your operator location to know more offers like these. Coupon/Offer Details: Verified on 23 Apr 2019. Airtel Money is Offering STD Calls at 25paisa. No code is Required. Users can avail STD calls @ 25 paisa for 30 days by doing a recharge of Rs 7 using Airtel Payments Bank. This is applicable only when the transaction is done through Airtel Payments Bank (wallet or savings account) on Myairtel app, Airtel website or USSD. Airtel Users can avail STD calls @ 25paisa for 30 days by doing a recharge of Rs 7 using Airtel Payments Bank.This is pertinent for client's own particular number energizes as it were . This is material Only for Prepaid clients as it were. Simply Pay With Airtel Money Now From Airtel Payments Bank. Do Airtel Recharge now. Coupon/Offer Details: Verified on 23 Apr 2019. Airtel is Offering 50% Cashback On First Transaction Made Using Airtel Payments Bank. No code is Required. Maximum cashback that can be availed is Rs 75.This is applicable only when the transaction is done through first transaction through Airtel Payments Bank . Customer can avail flat 50% cashback on recharges, bill payments, utility payments and online merchant payments using Airtel Payments Bank. Cashback will be credited to Airtel Payments Bank wallet or savings account within 3 working days of the transaction. Users avail flat 50% cashback on recharges, bill payments, utility payments and online merchant payments using Airtel Payments Bank.This is applicable only for new users of Airtel Payments Bank. This can be availed on eligible transactions (on any of the following Myairtel app, Airtel website or USSD) by a user during the offer period. Maximum Money can be added using Debit Card per day is Rs 25,000. This is not applicable for business-to-business (transactions between retailers and their agents) users. Just Airtel Recharge Now. Coupon/Offer Details: Verified on 23 Apr 2019. Buy new latest smartphones through easy EMI's that are available at Airtel Money. Buy all major mobile phones with low-cost EMI plans available here. Now buy Iphone, Samsung and latest phones. Offer valid only for limited period. Verified on 23 Apr 2019. Airtel is offering 5% Cashback on the Airtel Prepaid recharges and bill payments of value less than Rs 100 through MyAirtel App. This is is applicable only when the transaction is done through Airtel Payments Bank Savings Account/Airtel money wallet on Myairtel app, Airtel website, USSD. User can avail flat 5% Cashback on Airtel Prepaid recharges and bill payments of value less than Rs 100. And Up to Rs 75 Cashback on all Airtel recharges and bill payments (Mobile Prepaid, Mobile Postpaid, DTH, Broadband/Landline) that are of Rs 100 or above (Min. Assured Cashback of Rs 20. Every 100th user gets Rs 75 cashback). User can avail Cashback on a max. Of 6 transactions. Cashback will be credited to Airtel Payments Bank wallet or savings account within 3 working days of the transaction. Recharge Now. Verified on 23 Apr 2019. Airtel postpaid bill payment code is here. Get 15% cashback on Postpaid bill payments made using Airtel Money on the Myairtel app. This is valid only for new users. Get maximum cashback of Rs 50. This is applicable only when the user pays using Airtel Money on the Myairtel app. Also save upto 20% on family mobile spent. This Airtel Postpaid Bill payment Cashback will be credited to the Airtel Money wallet within 2 working days of transaction. This is Applicable only to new users of Airtel Money. Recharge Now. Verified on 23 Apr 2019. Airtel is Offering 5% cash back at select Indian Oil pumps in Bangalore on payments made using the Airtel Money app. This can be availed only when payments are made using Airtel Money. Users will get 5% cashback, up to a maximum of Rs 200. The discount will be in the form of a cashback which will be credited within 2 working days to the Airtel Money wallet used for payment. Get flat 25% off on Puma gift cards on transactions through Airtel Money. This is applicable on payments through app only. Wished you could magically pay for groceries after forgetting your wallet at home? Airtel money is the safest, most convenient and user-friendly medium for making payments. Airtel money is India’s first mobile wallet service by a telecom operator. They have an aim to offer an efficient alternative to cash transactions for all its customers. Airtel money load cash feature allows you to load money and use it anywhere for shopping and making payments. Also, get additional cashback and discounts with Airtel money recharge offers exclusively for Airtel customers. Airtel mobile customers can make use of the ubiquitous mobile application to make payments the easier way – anytime, anywhere! Customers can avail airtel money attractive offers and exclusive discounts that are offered at GrabOn and save money as you shop. Airtel money can be used to make all kinds of payments, both online and offline. Loading money into the mobile wallet now made easy with the load cash feature. Just enter your airtel mobile number and payment details on the web or mobile application and your mobile wallet are refilled. You can also avail the exclusive Airtel money load cash offers while loaning money to get decent cashback. Airtel money can be used to recharge any Airtel mobile, digital TV and pay postpaid, broadband and fixed line bills. Any DTH connection, prepaid service or wireless data card in the country can now be recharged using this mobile wallet. Tired of standing in long queues to pay your electricity bills? You can now pay them from the convenience of your home, at no additional cost, using Airtel money. The exclusive Airtel money offers on bill payments available at GrabOn are like a cherry on the cake. With airtel money you can book movie and travel tickets, shop online and more. It covers all the leading brands and service providers. All top e-commerce sites give the option of Airtel money while making payment. At GrabOn, find Airtel money offers eBay coupons, Amazon coupons and much more. Get the best shopping experience with the exclusive cashback on Airtel money. So why late? Get your Airtel sim today and enjoy the amazing experience with Airtel money. How To Use Airtel Money Coupons On GrabOn? Download the Airtel Money mobile app for online shopping, prepaid recharges, bill payments, ticket bookings and more. Get exclusive cash load in yourAirtel Moneyaccount using your net-banking account, credit or debit cards. The newAirtel Moneyapp provides you with the best in class payment experience that is easy, instant and rewarding. Itis a revolutionary service that gives you the power to make cashless transactions anywhere, anytime, right on your mobile. Get movie ticket cash back offers, deals and discounts only on GrabOn forAirtel Money.Having an Airtel Money account on your phone would mean that you can load money and use it for a host of services. You can send money, pay bills and recharge, directly from your mobile. You can send money to your family and friends, recharge your prepaid mobile and digital tv, pay mobile bills or utility bills, book movie tickets, pay for your shopping, both at physical stores and online and do so much more with Airtel Money.